What a beautiful photograph Mary. I love the light and shadows too. Browsing your list of prompts and I love them all. Have a beautiful day. Hey I was thinking "glass" might be a great inspiration word! Wow, some ride Mary. 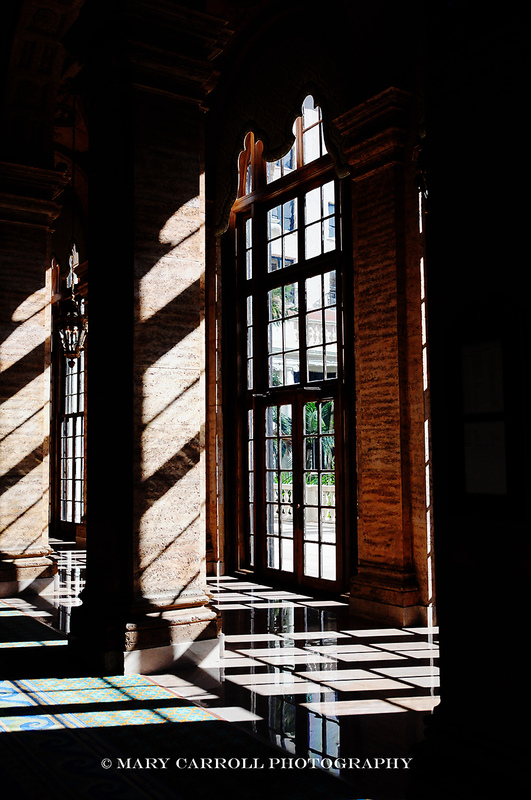 The place looks luxuriant and I like how the sun is streaming through the windows. All I can say is thank goodness I didn't go with stacked dishes. Wonderful windows at The Breakers that's for sure. Love the sunlight filtering through the windows. Gorgeous. I ended up with something from my files, too. You know what, I can't believe that I didn't mention the exquisite photography with the light and shadows on the floor in perfect geometrics. Had to return to say so since I was still thinking about the photo. Splendid choice for your prompt, dear friend! I adore how shadows play on structures! The light flooding through the windows is amazing!!! Thank you for hosting...and for challenging me to strive to improve my skills. I'm, totally, excited for the prompts for March!!! I wonder if you just captured this by fancy and it all looked so gorgeous or if you had to work your camera hard to get such a marvelous scene of light playing on dark. Either was it's a wonderful image for your subject today! This is fun, thanks for hosting. Mary the sunlight and shadow is incredible! Beautiful architecture and photography. The Breakers in Palm beach is stunning....Yu did a really good job of capturing the quiet reflection of this historic hotel. What a beautiful photo, thank you for sharing and for the party!